This little lighthouse (1879) commands a headland offering immense views along the coast. It's a great spot from which to watch the waves rolling in to long, beautiful Lighthouse Beach. It resides in Port Macquarie, a very nice coastal town in northern New South Wales. 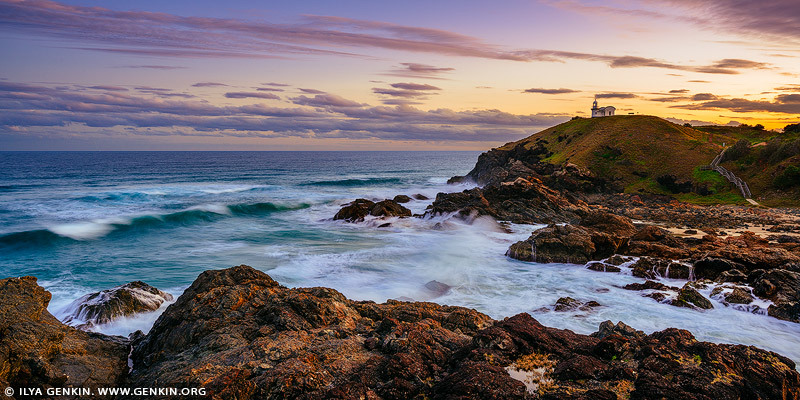 Built in 1879 its Australia's third oldest lighthouse, though at only 8 metres high, it's far from being tall. Over 20 ships were wrecked before the lighthouse was established, the first going down in 1823. This image belongs to the travel and nature stock photo library. This stock photo of Tacking Point Lighthouse at Sunset is available for licensing for commercial and editorial uses including websites, blogs, books, magazines, brochures and advertising. Restrictions may apply for images which contain third party copyrighted material or sensitive subjects. Photos of artwork are for editorial use only. This image id AU-PORT-MACQUARIE-0002 of Tacking Point Lighthouse at Sunset, is copyrighted © by Ilya Genkin. This is not a public domain image.